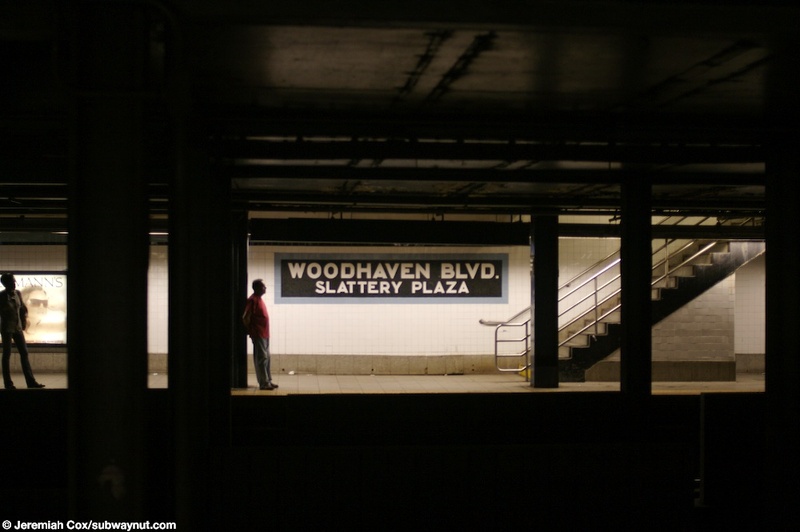 Woodhaven Blvd-Slattery Plaza (the former name of the intersection above the station where Eliot Av, Horace Harding Blvd, Woohaven Blvd, and Queens Blvd all met) is a station whose area above ground has been bisected by the Long Island Expressway. This ruined the plaza and made some of the station entrances quite far away from any useful place. 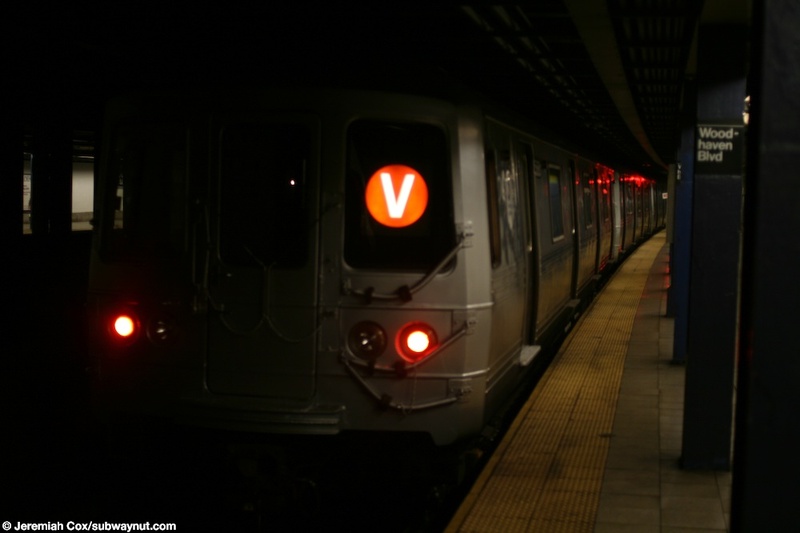 Unfortunately the LIE bisects Queens Blvd just east of all the station's exits so the stops multiple IND style exits don't provide a useful way to cross the BQE although they do and are even sighed as an underpass beneath Queens Blvd which looks to be from the stations originally. One exit in particular leads to a triangle beneath a highway interchange with the LIE whose only means of reaching the nearby neighborhood is by passing dangerous on/off ramps of the highway. 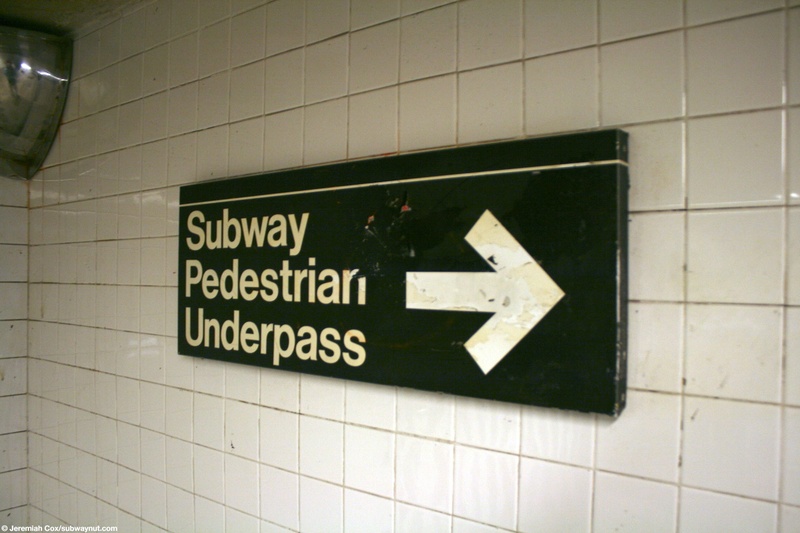 On some maps the station carries the additional designation of Queens Mall for the large shopping mall that started to open in the 1970s. 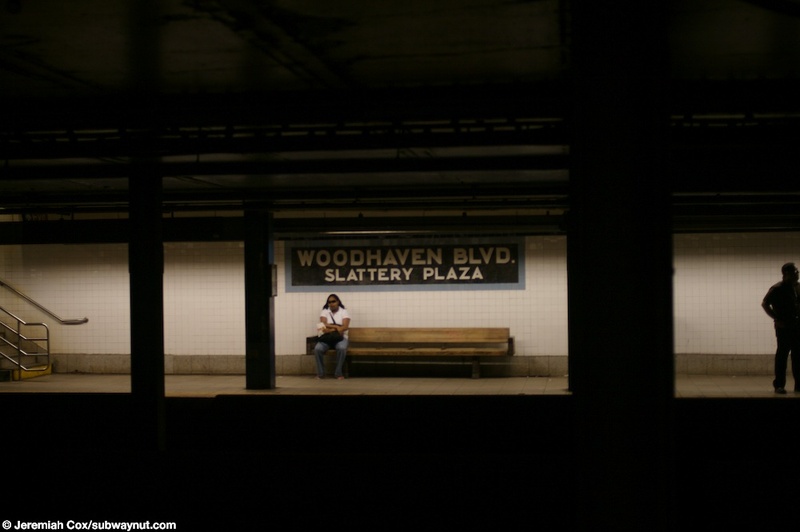 The stop's nearest exits are across from the mall and there isn't any direct underground access from the subway station. 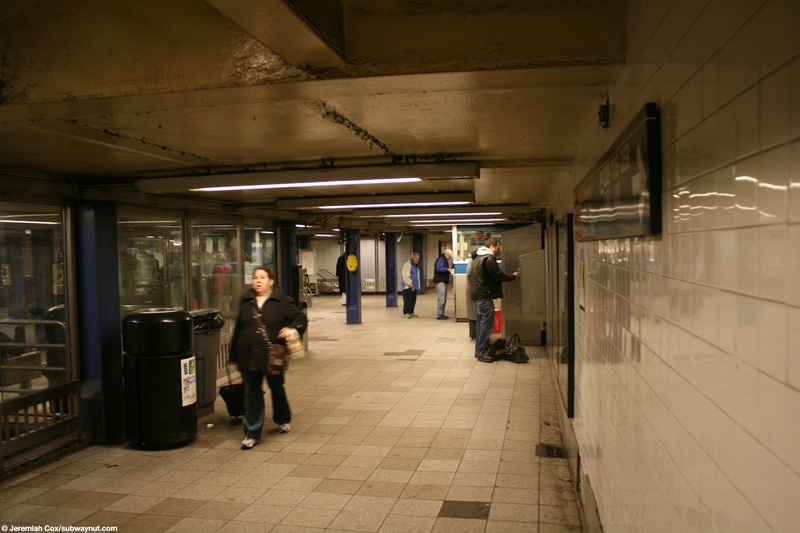 The stop has a mezzanine that is fully open and covers about most of the length of the station, is the full width of the tracks and has numerous staircases down to both platforms. It has two exit areas. 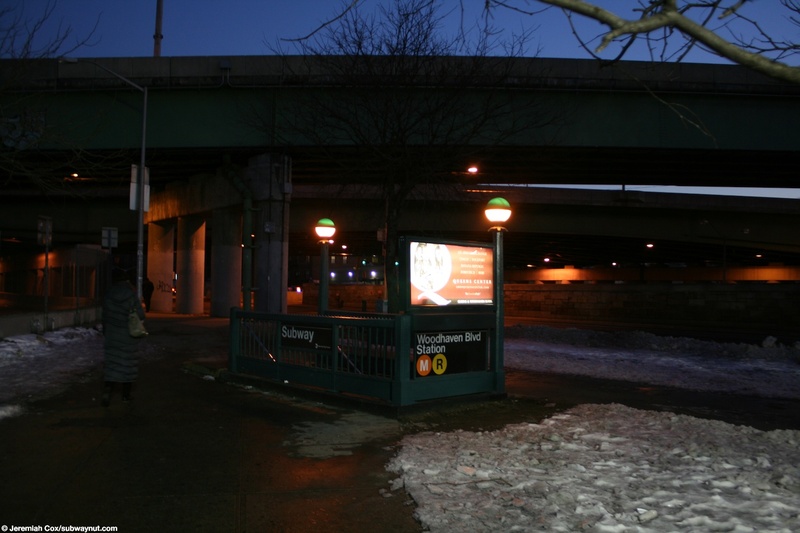 The part time one is at its eastern end and towards its northern corner where there is a bank of high turnstiles that lead out to a small passageway and the street stair dwarfed by the BQE, between the eastbound service road of Queens Blvd, and both an on and off ramp of the LIE (I-495) East and the expressway's odd partial clover leaf interchange with Queens Blvd. 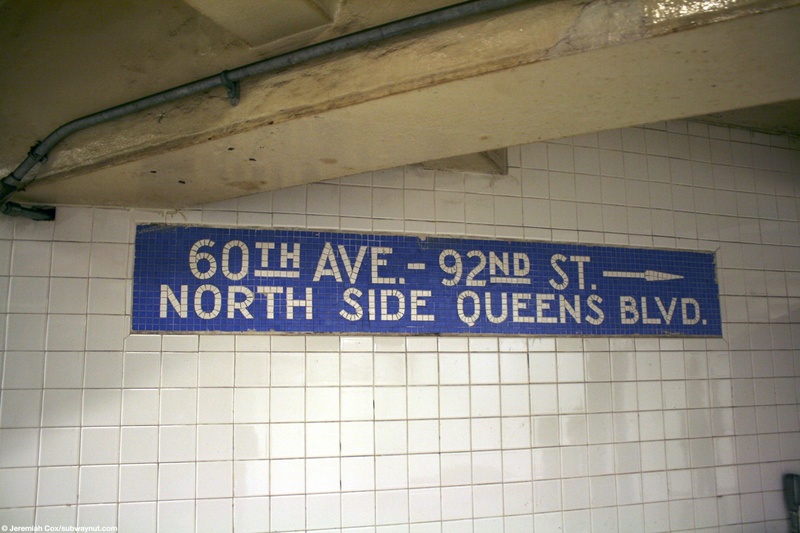 A historic original preserved mosaic still says the exit is to 60th Ave.-92nd St. & North Side Queens Blvd (60 Avenue has been cut off by the LIE). 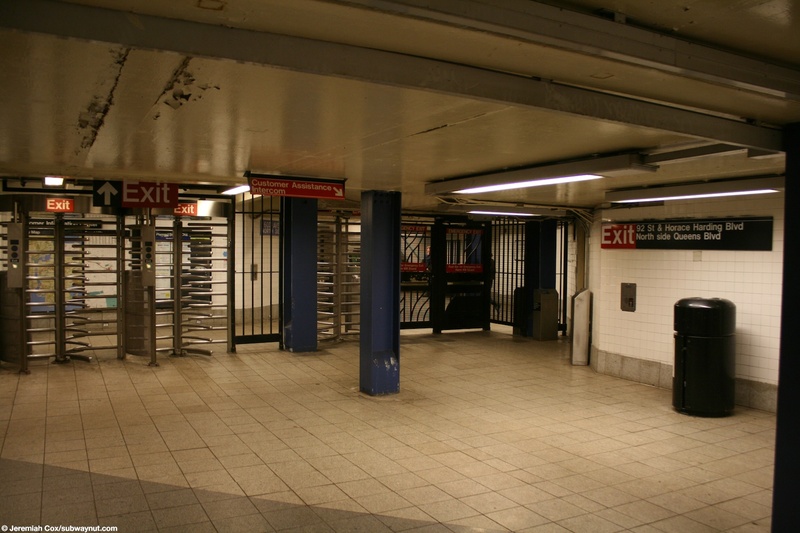 The main station exit is at the eastern end of the mezzanine and has the standard turnstiles but unique mostly glass with some light silver steel diving off the fare control area. 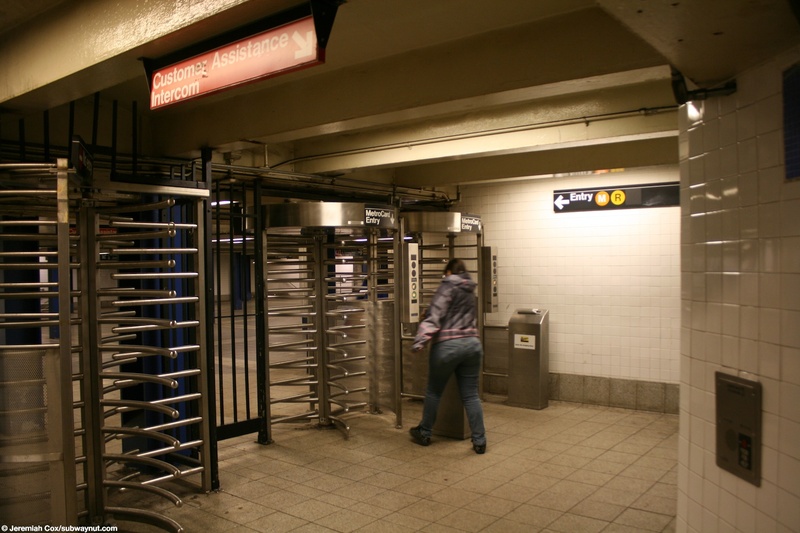 This is probably due to the stations renovations occurring in 1995, just as the MTA was starting to replace the old mechanical token turnstiles with the present electronic ones (in most stations this included putting up higher barriers to replace lower ones). 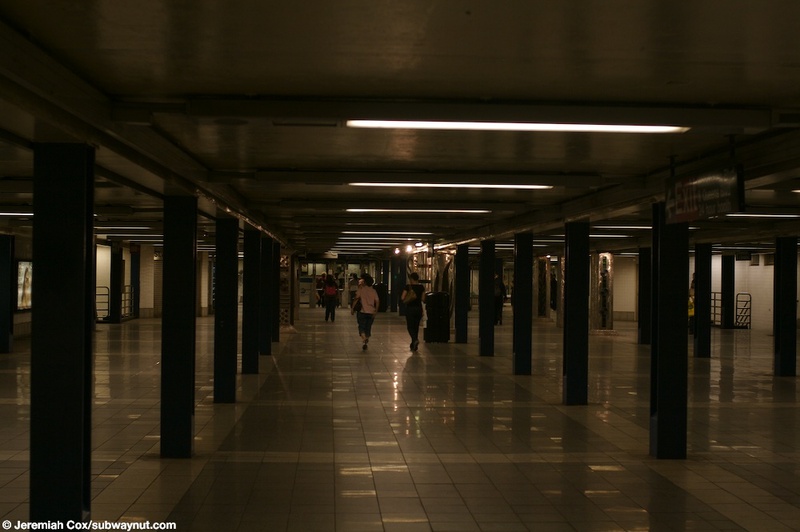 The area outside of fare control is relatively small but this exit as a long series of passageways that act as underpasses to Queens Blvd. 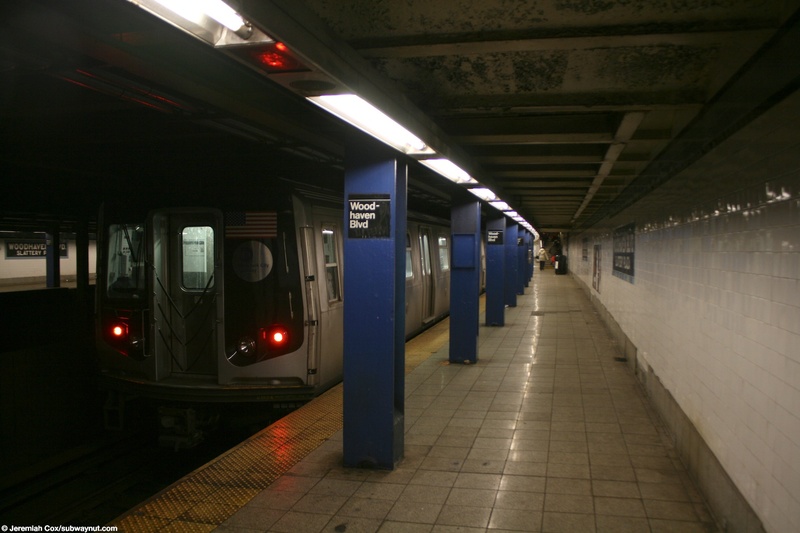 One is almost right at the northern end of the fare control area are two street stairs out to the north side of Queens Blvd between 59 Avenue an unamed street that is an off-ramp of the BQE (the same ramp that bisects the stations other entrance). 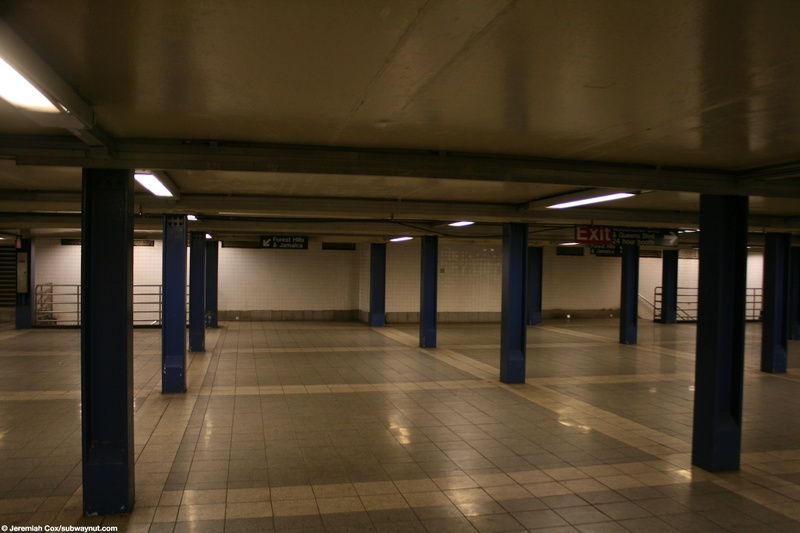 There is then a pedestrian underpass leaving from the other side of this fare control area where a passageway goes south a short bit and then turns east for a much longer narrow white tiled passageway. 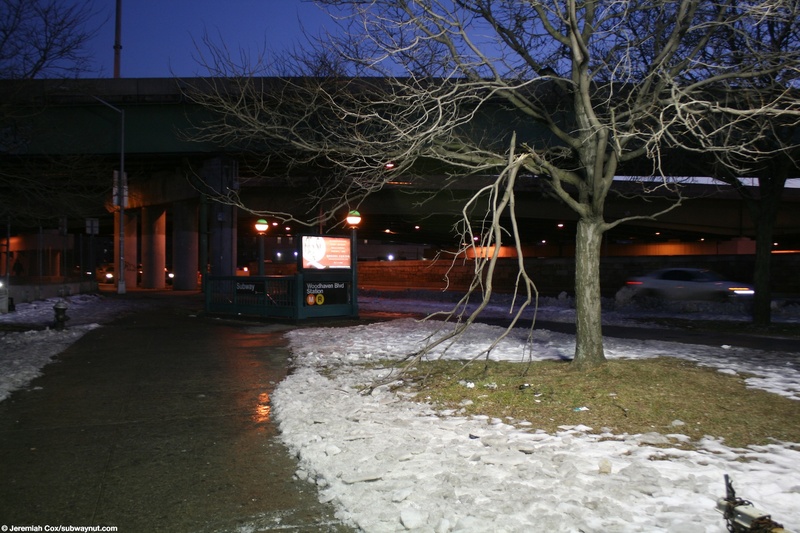 Shortly there's a short brach to a street stair up to the SW corner of Queens and Woodhaven Blvd (alongside an LIE onramp), before it continues beneath to its final exit at a streetstair to the SE corner (alongside an LIE onramp). 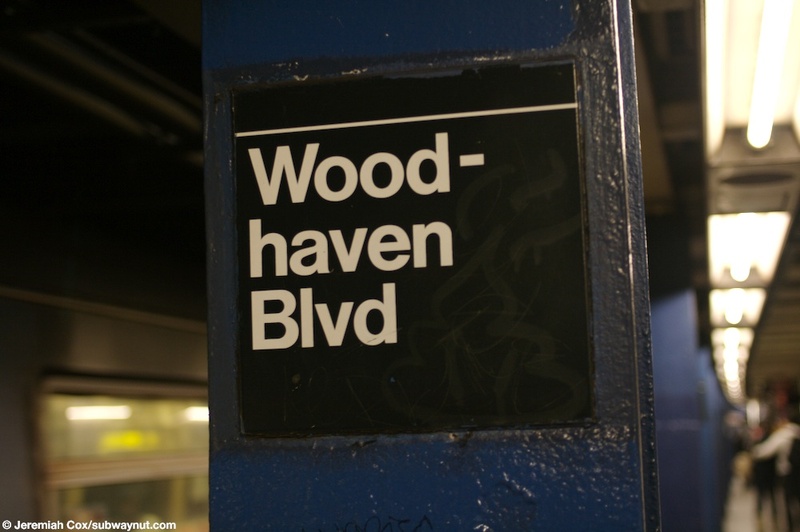 For the stations IND renovated style, the trimline is dark blue with a narrow black boarder, but there is no tile text, the name tablets say Woodhaven Blvd with Slattery Plaza as a subtext, white on a black background with the blue boarder. 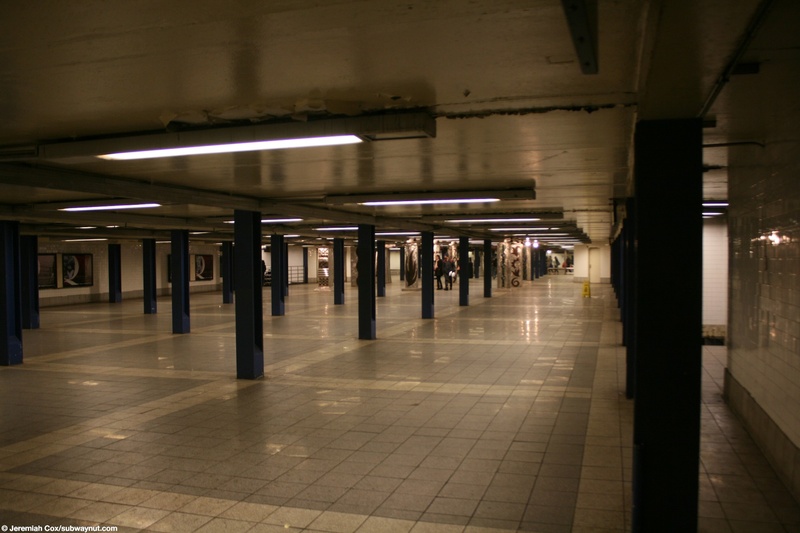 All the columns on the platforms and on the mezzanine (except for those covered by the artwork) are blue. 25 June, 2008 (woodhavenr2) Looking across the 4 tracks to a name tablet on the opposite platform. 4 January, 2011 (woodhavenr10) An original preserved mosaic for 92 St-60 Av-North Side of Queens Blvd, I bet there was an exit to the south side at some time that would now be directly beneath the LIE. 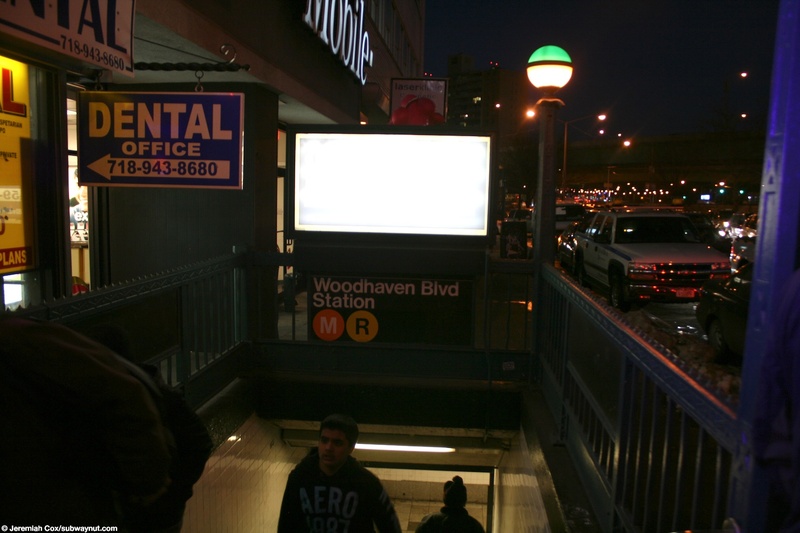 (woodhavenr13) A random NYPD floodlight lights the street stair beneath the LIE.